According to Dataxis forecasts, the Pay-TV market in this region* will grow at a 1.6% CAGR between 2017 and 2023 to reach 59.7 million subscribers. The Russian market represents 80% of the total today and its share should remain stable until the end of the period. Pay-TV revenues will approach €2 billion** by 2023. 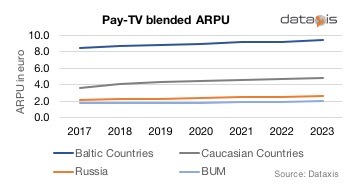 Blended ARPUs are expected to grow steadily across all regions but will remain low compared to the industry standards, ranging from €2 to €8 with relatively higher ARPU for premium services from Viasat in Baltic countries or NTV Plus in Russia for instance. ** Exchange rate from local currencies to Euro extracted from xe.converter as of May 4th, 2018.